On the coldest day of the year, it seemed like a great idea to get outside and go for a long, brisk walk around the outskirts of Bristol. You’d think it would be a lot more appealing to snuggle up indoors with a good book and a cup of tea. Thankfully some good company, including a very excitable four legged friend, made it more than enjoyable. All that running around meant a certain someone was keeping warm! I thought this fitted in nicely with the ‘Warmth’ theme: the sun, just setting in the sky, is throwing out its last few warming rays, and highlights the dog’s warm golden coat. 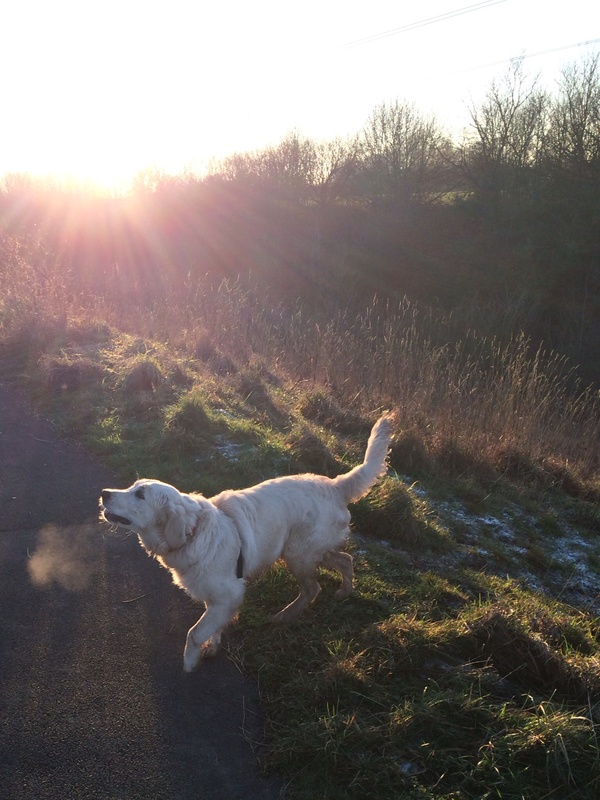 Of course the dog’s breath on the left of the image is warm and clashes against the cold afternoon air creating the wisp of breath before her. And last but not least there’s the warm, expectant gaze of the dog towards its master, just out of the shot, and the yummy treat that awaits! Hope you’ve all had a lovely Monday, enjoy your dog walking today, and may it be sunny (if cold!) with you as well!